Gurugram, 19th April, 2017: Amway India, country’s leading direct selling FMCG Company, today partnered with Gurugram Police for Project ‘Sabal’. 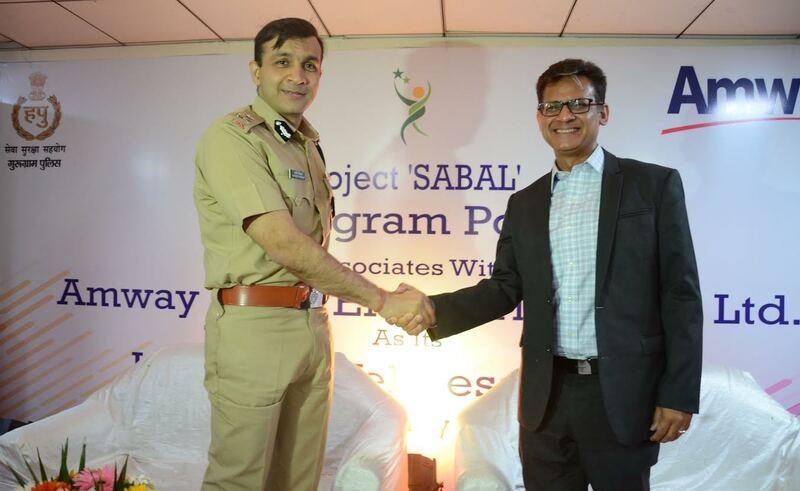 A Memorandum of Understanding has been signed between Gurugram Police and Amway India today, in the presence of Mr. Sandeep Khirwar, IPS, Commissioner of Police, Gurugram and Mr. Anshu Budhraja, General Manager, Amway India. Under the Project, Amway India will undertake self-defense training of around 10,000 school-going girls from 50 schools of Gurugram and will support the health & wellness of Gurugram Police officials by organizing multiple healthy living workshops. “Police officials play a central role in enforcing the law. However their routine lives can be really stressful. We hope that the Police officials will find the health & wellness workshops fruitful, “added Anshu. Amway India is a wholly owned subsidiary of Amway with headquarters located in Ada, Michigan, USA. Amway is one of the largest Direct Selling companies in the world with presence in over 100 countries & territories. Globally, Amway is over 57 years old, US $ 8.8 billion, manufacturer and direct seller of high quality consumer goods. Amway’s innovation and industry-leading R&D has seen more than 1200 patents granted and another 500 patents pending. Amway has nearly 1000 scientists across 75 research and development and quality assurance laboratories worldwide. Amway India sells more than 130 daily use products across categories like Nutrition, Beauty, Personal Care and Home Care through individuals who make personal recommendations regarding the use of distinctive high quality products. Amway products are widely recognized and appreciated for their quality and value. These products are backed by a money back guarantee for 100% satisfaction of use. Amway products are popular not just in India, but across the world. Nutrilite is the world's No. 1 selling vitamins and dietary supplements brand* while Artistry is among the world’s top five, largest selling, premium skincare brands. * Amway India also offers ‘Attitude’, a premium skincare and cosmetics brand targeted at India youth. The product range has been developed keeping the needs of Indian consumers into consideration. Amway India is aggressively entering into newer categories. Most notably, the company has launched a Weight management program called ‘W.O.W.’ (Will over Weight) which has been really appreciated by the consumers in India. Recently, Amway has forayed into consumer durables segment with the launch of a premium cookware range Amway Queen. Amway’s manufacturing facility in India is located at Nilakottai in the Dindigul district of Tamil Nadu. This is Amway’s third manufacturing plant located outside of USA. The other plants are located in China and Vietnam. *Source Euromonitor International Limited. Vitamins and Dietary Supplements, World, GBN, Retail Value RSP, % breakdown, 2015. *Source Euromonitor International Limited. Beauty and Personal Care 2016, Premium Beauty and Personal Care and Premium Skin Care category and subcategory, global 2015 value RSP.